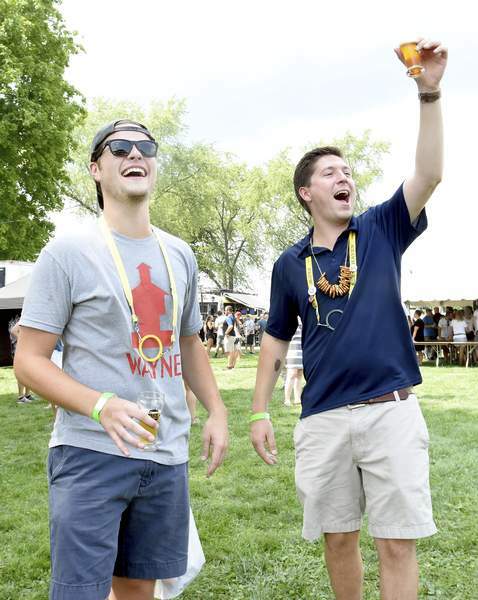 Photos by Rachel Von | The Journal Gazette Zack Tippmann, left, and Nick Feipel enjoy singing along during the Leigh Roberson musical performance Saturday at Brew Haven at Schnelker Park in New Haven. 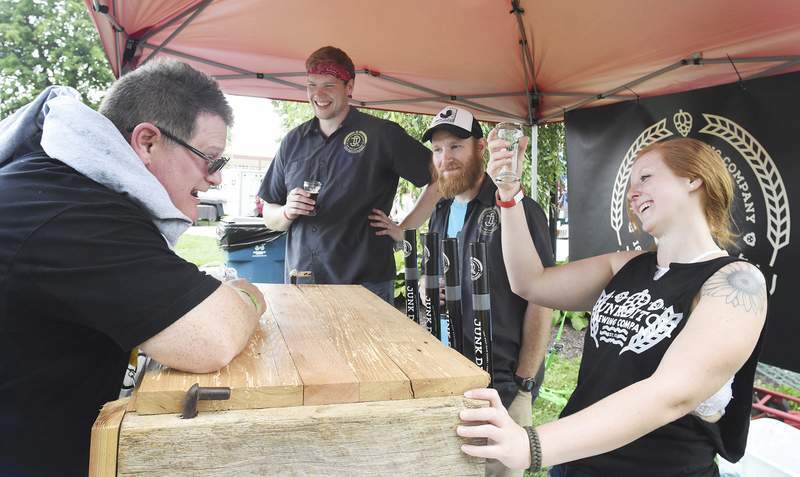 Casie Wright of Junk Ditch Brewing Company in Fort Wayne gets ready to pour a beer Saturday for Tracy Carboni as Patrick Gould, second from left, and Todd Stone look on. 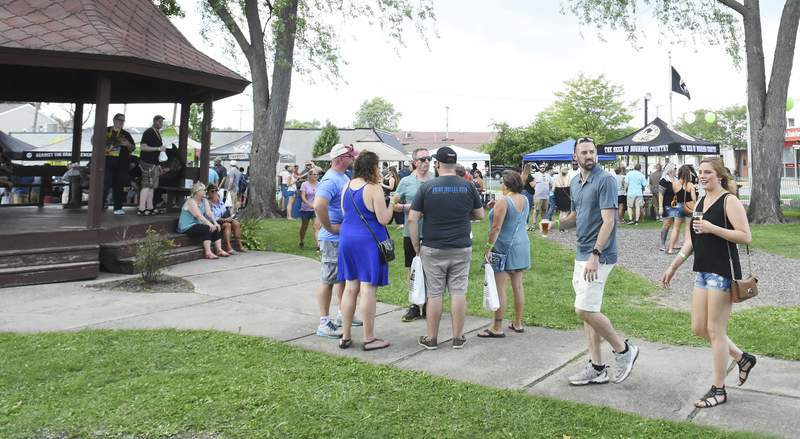 Despite the heat, a line wrapped around Schnelker Park in New Haven for the eighth annual Brew Haven Festival on Saturday. 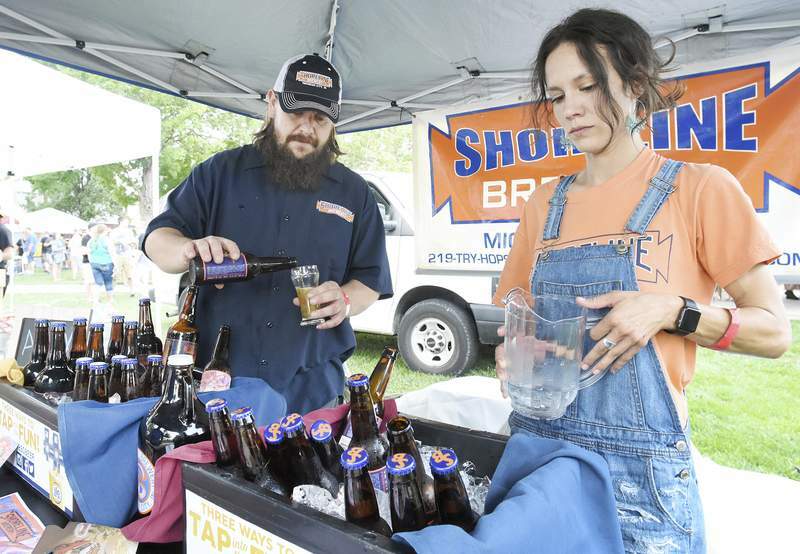 Expecting attendance to be more than 2,000, the festival featured about 300 craft beers from more than 50 breweries. The Trion Tavern, Pour Misfits Brew Crew and MASH sponsored the event. While many breweries featured were local, others came from as far as Wyoming, like Melvin Brewing. Dave Chichura, brewing director, said founder Jeremy Tofte began thinking about expanding their beer to a wider audience. “It's kind of blown up ever since,” Chichura said. With Fort Wayne being the second-largest city in the state, it would be a key market for Melvin Brewing. The brewery is making its way around Indiana, and will begin distributing in the state soon. “We're just going to see what happens. We're getting our name out there and our beer out there,” Chichura said. Fort Wayne native Christie Wentland has never been to a brewing event, and called Brew Haven her inaugural festival. While she came to explore different ciders, her plan was derailed. 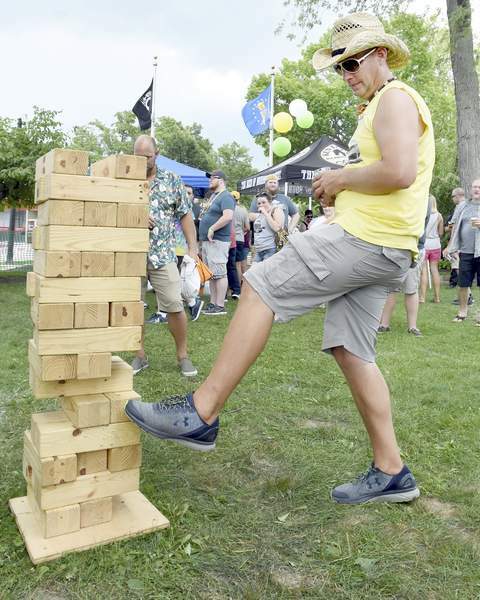 Josh Henricks, another Fort Wayne native, has attended beer festivals across the state, but he says he always tries to come to Brew Haven every year. One thing he looks forward to is 3 Floyds Brewing Co. out of Munster and local breweries that have popped up. “When we come to brew fests, we're looking for things that aren't normally available,” Henricks said. In comparison with other beer festivals in the area, Jacquay said they're all trying to achieve the same thing.